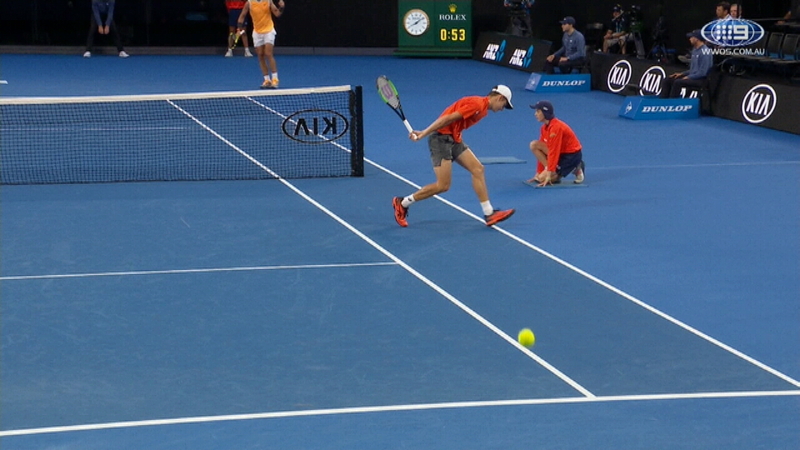 Rafael Nadal has given a glowing review of Australian phenom Alex de Minaur after ending the teenager's Australian Open dreams in straight-sets. Nadal was at his best throughout the contest, appearing on another level to the 19-year-old, but was extremely gallant in defeat, saving five match points before Nadal prevailed 6-1 6-2 6-4. Following the win, the 17-time Grand Slam winner predicted a bright future for the Australian 27th seed. "I want to congratulate Alex for a great start to the season, I think he has an amazing future," Nadal told Nine's John McEnroe. "He is a big fighter. He is super quick. He is the fastest on the tour. "That last point when I was serving for the match was unbelievable." The match-up with Nadal was de Minaur's second Grand Slam battle against the Spaniard after the duo's 2018 Wimbledon clash which ironically finished with an identical scoreline. Despite the crowd being vociferously against him throughout the contest, Nadal showed his appreciation for Australia's tennis fans. "No complaints at all," he said of the lack of support. "I can't thank enough all the support I've received here throughout my career. "I want to thank all the fans because in the low moments the energy that they give me is very important." The 32-year-old has experienced several injuries over the past two years and explained how his experience has helped him deal with the setbacks. "After what I went through during all of my career, I've had a lot of stops for injury so I've been in that situation a couple of times," he said. "Even if it wasn't the ideal thing, I think I had more or less a good off-season and that helps for my confidence." Nadal's next opponent will be Thomas Berdych who downed Diego Schwartzman in the third-round, and the Spaniard was wary of the unseeded Czech who is a two-time Australian Open semi-finalist. "He has been outside of the courts for a while but at the same time he has had the chance to play the first week of the season and he did very well," he said. "When you are coming back from a tough period of injuries and you feel good again, if you're playing well, the energy is high so I predict a very, very difficult match. "He's playing well. I need to play at my best."